There are over 100 million daily coffee drinkers in the United States and 54% of Americans over the age of 18 drink coffee everyday. Most make it from the home and most want to drink good coffee… and that’s where coffee grinders come it. I have purchased a lot of different coffee grinders and I have found that only a few of them were good enough to use over and over again. I don’t want you to waste your time or money on anything you won’t like or use so please scroll down a bit and I’ll help you find the perfect manual coffee grinder for your french press coffee – one that you’ll use over and over for a long time to come. Before we get to the meat of this article I’ll say up front that of all the manual grinders out there I would advise almost everyone to buy the Hario Skerton with the upgrade kit. This pair of purchases will get you extremely uniform coarse grind that will result in better coffee with less sediment in your cup. The price is hard to beat too! Click here to jump straight to the list of the best grinders. You know that it isn’t only the quality of the coffee beans used that makes a good cup of coffee, it is also about the process of making it and the equipment used. Making coffee in a French press is a perfect example of this. People have tried to perfect the art over the years and it’s become clear that the grinder you use to grind your coffee beans makes a big difference. Of course, you could invest hundreds of dollars on a top of the line Rancilio Rocky, but let’s face it, most of us don’t have that kind of money to spend on our daily coffee addiction. The next best thing is to get the best and most affordable manual grinder for French press coffee you can find. The manual grinders are much more affordable than the electric ones and they can perform quite well… and because French press coffee only requires coarse grounds, it doesn’t take very long to crank out your daily allotment. What are the Best Manual Grinders For The French Press? The following three models are the best coffee grinders for French press coffee. They are affordable models that are not cheaply made. The burrs are stable enough to produce consistent grind with minimal dust produced. Styling is really up to you. Lower down this page, I will summarize them individually, but you can click on any of these to see product specs and pricing. Hario Ceramic Coffee Mill Skerton Storage Capacity (100g) Hario Coffee Mill Slim Grinder, Mini Most Consistent Hand Coffee Grinder & Coffee Press – Ceramic Burr Grinder made with Professional Grade Stainless Steel. 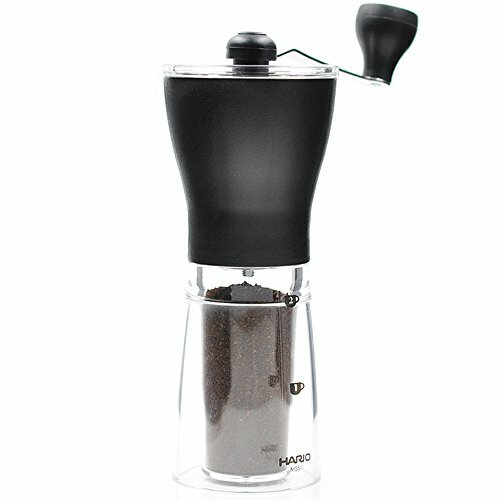 Manual Coffee Grinder – Perfect Coffee Grinder for French Press, Espresso or as a Spice Grinder or Herb Grinder. 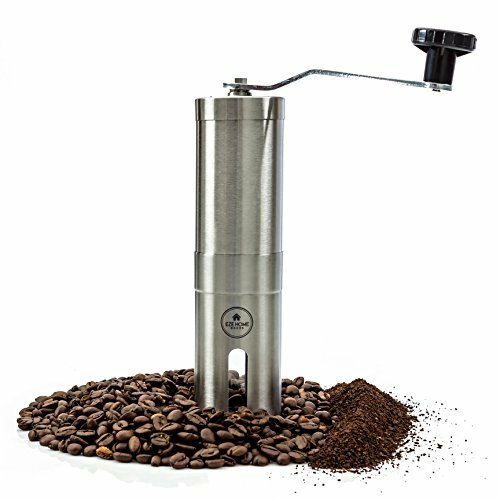 Editor’s Note – If you buy any hand coffee grinder for French press prep you will need to fiddle around with the grind size adjustment to get the right grind size. Each of these devices allows you the freedom to choose size by turning a gear under the movable burr. Try a few different settings to find the size you are most comfortable with for your cafetiere and then just leave it there indefinitely. There are many ways of making coffee, all of which require different coarseness of coffee bean grind. For example: when you use a drip coffee maker, you should be looking for a finer grind of coffee in comparison to that of a French press. One of the least expensive options is to put your beans in a bag and crush them with a hammer… or to use a good manual burr grinder. For those who don’t have time constraints in the morning, this is a great direction to go in if you are wanting to save some money. It isn’t only a cheaper tool to buy (compared to electric burr grinders) but it also has no effect on your electricity bill. It is also cheaper to buy whole coffee beans than it is to buy them already ground. Not to mention that the other approaches to making coffee require more equipment that you need to buy. For example: in drip coffee makers you need to buy paper filters or get washable gold filters among other possible things. The naturally-present oil in the coffee is not absorbed by filters. This oil seems to give the cup of coffee a desirable creaminess and taste. People like investing their time in the creation of their cup of coffee. It gives them a greater sense of satisfaction when they drink it. It is cheaper and requires less parts to make the cup of coffee. It is the purest form of coffee (classic) that captures the concentrated flavors with results such as these: deep, dark and full-flavored. The French press, itself, is smaller in size and more attractive in a home than a coffee maker. Drinking coffee using this method can be therapeutic. You have control over the strength of the coffee. A French press is easy to clean. A French press can also be used in place of a tea infuser to brew loose tea. Click here to read more on the differences between French press and drip coffee. Does a Manual Grinder Make Good Coarse Ground Coffee? Before I explain why there is a need for a coarse grind of coffee beans, I am going to explain how a French press works. First off, the reason for a coarse grind of coffee beans is because finer grounds of coffee will slip through the press filter and into the coffee. So the process is as follows: you place your coarse ground coffee beans in the French press together with hot water. Then you stir it and leave it there for a few minutes; this is where the brewing takes place. When the few minutes are up, you then press the plunger to trap the coffee grounds at the bottom of the French press beaker. This is the reason why French pressed coffee captures more of the coffee’s flavor and keeps the natural coffee bean oil in it, because the coffee grounds remain in direct contact with the brewing water. So, instead of using a paper filter like in drip coffee makers, the French press has a mesh that isolates the coffee bean grind from the brewing water without absorbing any of the bean extract and so retains the natural goodness of coffee. This is the simple process to using a French press. Some French presses are better than others. If you are interested in starting your new journey to a better cup of coffee, here are some French presses that have been the most successful in giving the most consistent cup of coffee: KONA or Bodum Brazil. Best selling Bodum French presses are just fine, and they are microwave safe, but the best French press is probably the Frieling Insulated French Press with Dual Screen. That one is a bit pricey, but worth the investment, if you ask me. 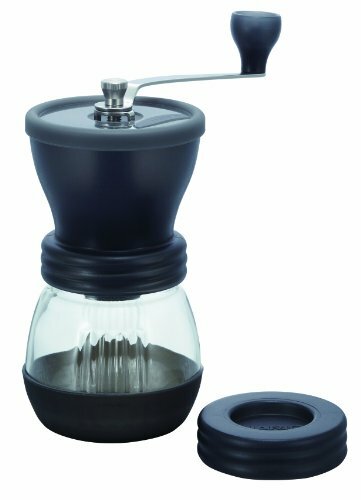 Are Manual Grinders Good for French Press? Now that we have touched on French presses let’s talk about manual grinders. Let’s be clear about something. Manual grinders are not the best for French pressing coffee because they falter a bit in the coarse range. They are a lot better than the cheapest electric burr grinders, but pale in comparison to actual top of the line models. Hario makes both the Mini Mill and the Skerton, which are among the best for coarse range grinding. You can even pick up this super cheap upgrade kit for the Skerton. It’s a special coarse grind attachment to help stabilize the burrs in coarse grinding situations. This can make your grounds more consistent and it’s worth the small increase in total investment cost. These two units, however, are top of the line manual grinders that use burrs instead of blades. These burs are ceramic, so they do not rust. Burs remain sharp longer than blades do, but when burs begin to lose their sharpness, they start crushing the beans more than grinding them, kind of like how using a food processor to grind coffee would do. This is no good for French pressing coffee, as it produces dust. Dust or finer grinds are not desirable for French pressing coffee as they leave “mud” at the bottom of your cup of coffee which may be unpleasant. That is why it is essential that you get the best tool for the job and make sure to keep that tool in good functioning order. Are Hand Crank Coffee Grinders Hard To Use? 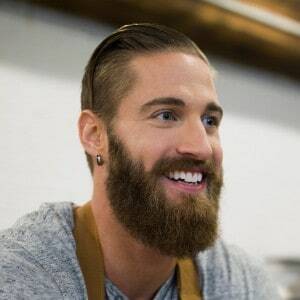 Manual grinders do take a little bit of elbow grease, but if you don’t mind grinding your own coffee, you can produce coffee just as good as, if not better than, using an electric grinder priced two to three times as high. You see, manual grinders don’t heat beans up during the grinding process, which can have a small impact on the flavor. 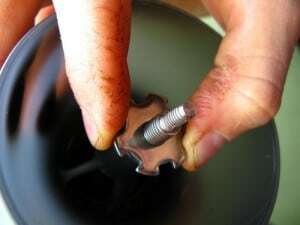 They are also known to be more durable than electric grinders, with less parts to worry about. The backbone for a good cup of coffee is also about the consistency of the coarseness of the grind and so getting better quality equipment will help you reach that goal. The best coffee grinders are made to an incredibly high level of build quality. You just don’t get that with the cheaper electric burr grinders, but with manual crank grinders the quality of materials can be much higher without inflating the price too much. Cranking a manual grinder for French press will take the average person no more than a minute or two, because it will take far less turns that it would to hand crank espresso-size grind. Because the coarse grind is bigger, it takes less time to go through your beans. I personally have cranked grind for both French press and espresso, and let me tell you it is no fun doing espresso grind – it takes forever, but a coarse French press grind’s size is not a problem. It doesn’t take very long and I love that it’s quiet compared to all the noise generated by even the best performing electrics. You are now at the end of my article. You read this because you had questions about the things that I talked about or maybe you were just curious, but whatever the reasons are, I hope that you are now more educated and equipped to face the world of coffee with great boldness and confidence.